The GoFundMe fundraiser for the victims of the Humboldt Broncos bus collision has raised more than $10.6 million, making it the largest such campaign in Canadian history. Over the past six days, more than 123,135 people have donated money to the campaign, and the number continues to rise. The original goal was set at $100,000 and was easily surpassed. The goal was then increased multiple times before stopping at $4 million. Even then, the donations kept coming. Sylvie Kellington started the drive, but it has since been handed over to the Humboldt Broncos Junior Hockey Association. "This response was very unexpected (well over 100,000 donations), and I'm grateful the world came together to show it cares," Kellington wrote in an update to the page. The money is still under the control of GoFundMe, as is policy for a campaign of this size. 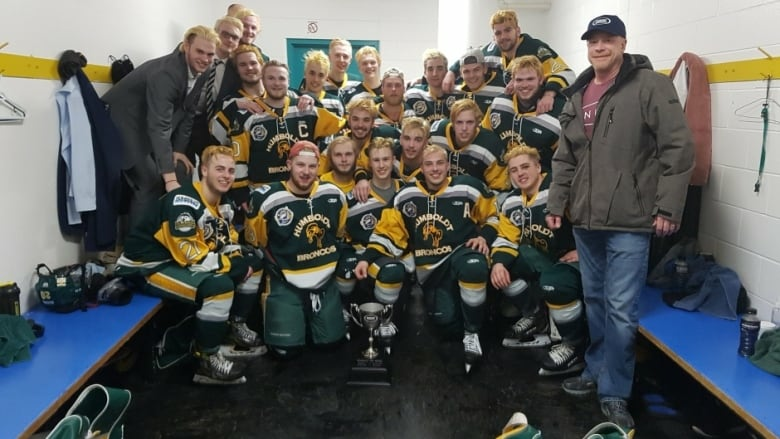 Sixteen people were killed in a collision April 6 between the team bus, carrying the Saskatchewan Junior Hockey League's Humboldt Broncos and staff members, and a semi-trailer. Another 13 people were injured. The team was on its way to face the Nipawin Hawks in a playoff game when the collision occurred at the intersection of highways 335 and 35. Kenneth Feinberg, a U.S.-based lawyer who has dealt with similar funds such as those for the victims of the September 11 terrorist attacks and for the victims of the Boston Marathon bombing, told CBC Radio's Calgary Eyeopener that a series of town hall meetings in the area should be held. They could discuss how the funds would be distributed among the families of the dead and the injured. "It's not easy. It's very emotional. But it's not rocket science," Feinberg said. He added that the money should be disbursed in equal amounts to the families of the victims who died, regardless of current financial situations of those affected. "It slows things down and creates more divisiveness than you want," he said. When it comes to the injured, maybe the money to them could be determined by the length of their hospital stays. But first, he said, a well-known and respected local person should be appointed to administer the fund — without being paid for it — and to disburse the money in a way that is in line with community sentiment. Now that the fund has as much money as it does, Feinberg said the campaign should be shut down. It should not be viewed as an ongoing fund. "These programs are fashioned, and drafted and designed, and then within 60 to 90 days, get the money out, shut down the fund. Everybody try and move on as best you can after a tragedy," Feinberg said. On discussions about keeping the fund active or establishing a memorial of some sort for the victims, Feinberg said he did not think that would be a helpful step to take, based on his own experience in the U.S.
"I don't think local citizens want an ongoing compensation program that would constantly remind people of this horrific tragedy." The donations have been a mix of corporate and individual, including some from NHL players like Dion Phaneuf and Brendan Gallagher. At $10.6 million Cdn, the Humboldt Broncos fund is more than $8.4 million US, making it the third largest GoFundMe campaign of its kind. The Time's Up Legal Defence Fund, which connects people who have experienced sexual harassment or assault in the workplace with public relations and legal teams, has raised more than $21 million US. Almost $12 million US has been raised for victims of the Las Vegas shooting in October, which saw 58 people killed by a gunman who then shot himself.